I've never really gotten into Draw and Tell stories, partly because the stories that go with them usually aren't very interesting to me. And also because I don't draw very well. 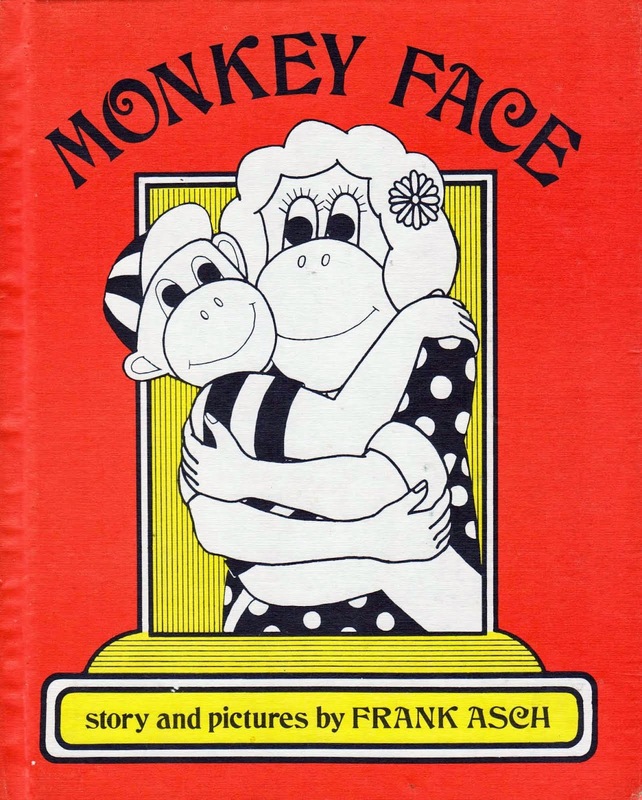 But Frank Asch's Monkey Face is perfect, because the story is great and you're not supposed to draw well. In the book, Monkey draws a simple picture of his mother. As he walks home he meets different animals one after another. Each animal gives him a suggestion to improve it, so Monkey takes out his pen and adds a bit. 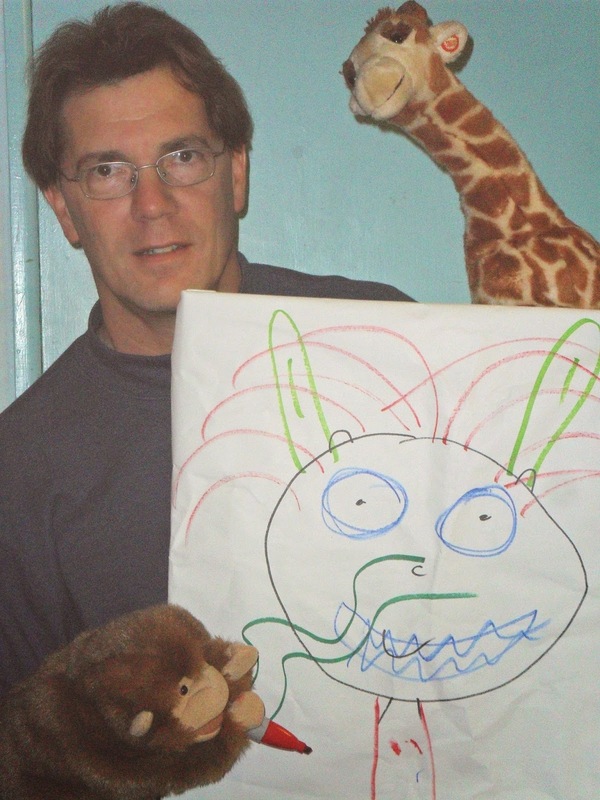 That part about "he meets different animals one after another" almost always means: Puppets! The "taking out his pen" part is a bit harder, but my Monkey puppet has very workable hands, and after all, the pictures don't have to be that good. I use a standing white board that I can get behind to do the drawings. Sometimes I have an easel, other times (like in the photos below) I just hold it on my lap and lean it against me while I retrieve puppets. 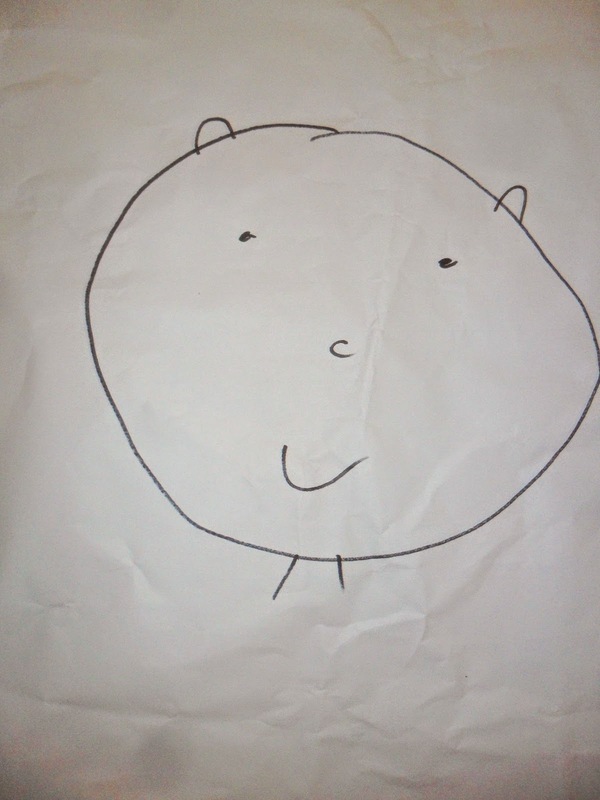 I have Monkey draw the first picture with his pen, then stand back and look at it. I don't want to move the drawing surface, so the "walking home" part happens from narration: "Monkey walked home with his picture, and on the way he met......Owl!" At this point I reach behind the whiteboard with my left hand and Owl pops out above the board. Owl likes the picture, but makes a suggestion: "You made the eyes too small." Once he's done, Owl praises the new version ("Fine work!") and Monkey goes on. With each new animal he meets, he "improves" the drawing, with the adjustment always matching a prominent feature of the animal: Alligator = big sharp teeth; Rabbit = long ears; Elephant = long nose; Lion = mane; Giraffe = long neck. So the drawing gets sillier and sillier. You could substitute puppets if needed, as long as the sub has a notable feature that can easily be added on to the drawing. By the time he meets Giraffe, it looks pretty crazy. Asch always has a nice way with language. In this book each animal always thinks the picture is great ("I love it!"). And after Monkey shows them the new version they add more praise: "Unforgettable!" "Much better!" and the like. I don't always match the book exactly but do try to use interesting vocabulary for each animal. When Monkey finally gets home he shows it to his Mother. You could use another Monkey puppet for Mother, but I usually skip that and just speak as Mother. When Monkey asks: "Do you like it?" Mother steps back, looks at it, and thinks for a minute. I believe the kids are always thinking that she's going to say something disparaging or at least act surprised, but instead it's the perfect parent answer: "I love it!" "Just the way it is?" says Monkey. "Just the way it is." And she hangs it on the refrigerator. (Which I can't do because the drawing is on a board, but everyone gets the idea). There are many different ways to tell this one. It works great without puppets, just using a pen and paper. That's where I first learned it, from Bonnie Janssen of Alameda County Library. 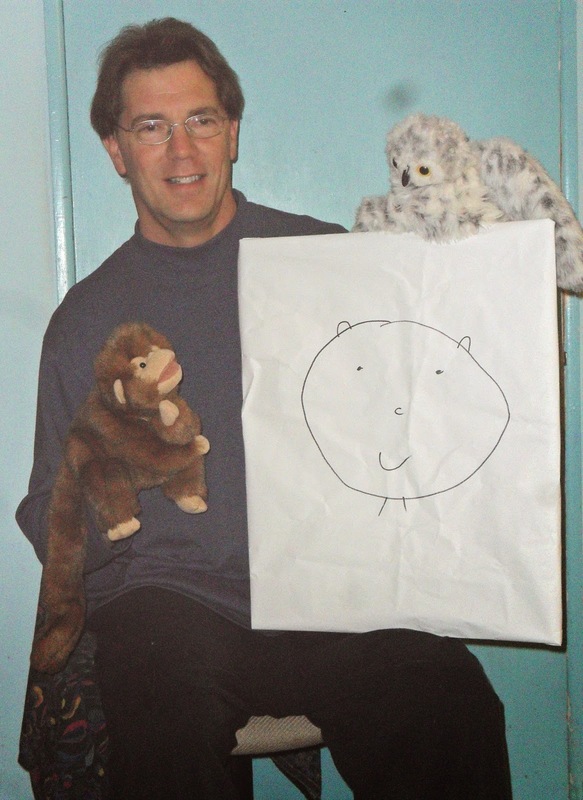 I've also told it using the Monkey puppet, but with paper on a clipboard instead of a whiteboard. This is kind of fun because you can draw without the kids seeing, then reveal the drawing all at once. But also it's one more thing to handle. Or, you can do it with the Monkey puppets, but without all of the other puppets. The fun there is that kids sort of ponder along with you as they imaging that Owl or Elephant and anticipate what the picture will look like. 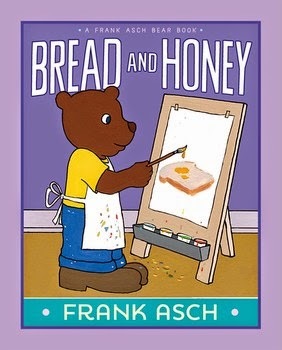 Monkey Face is an old (1977) out-of-print book; Asch actually retold it as Bread and Honey in 1981 and it looks that version is being reissued in March 2015! B and H changes the monkey to a bear (I think it's the bear from Happy Birthday Moon) and adds a little more back-story to the beginning and end. The original also uses more interesting vocabulary. When Giraffe sees the now long-necked picture she says "Perfect" in B & H; in Monkey Face her line is: "How elevating!" (Which I enjoy, though the kids probably don't get). So I still think the original is stronger for storytelling. Plus none of my puppet Bears can hold a pen as well as my Monkey. 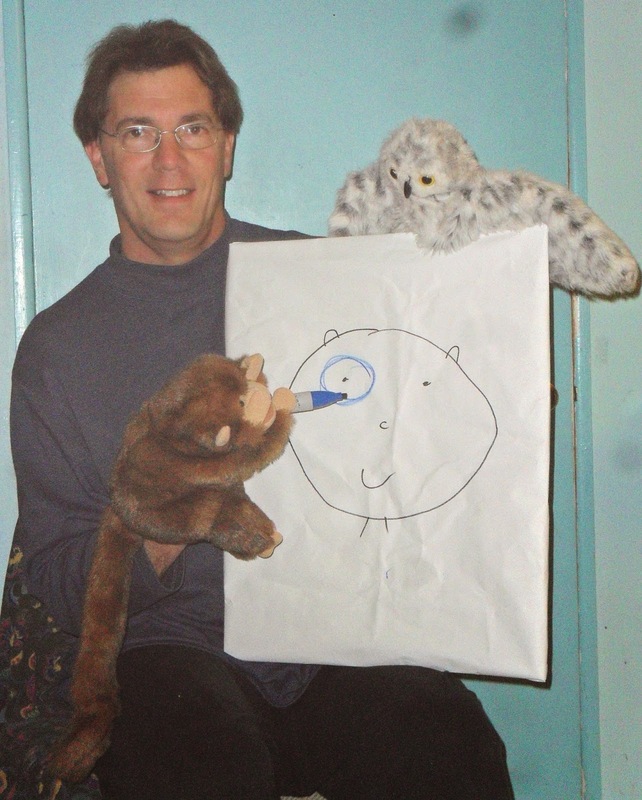 I've been a children's librarian since 1986 and enjoy storytelling with books, puppets, props, and whatever else works.